We’ve long known that some of the most impressive migrations in the bird world are undertaken by shorebirds, and biologists at the Center for Conservation Biology at William & Mary University in Williamsburg, Virginia, are adding to that impressive cache of knowledge. 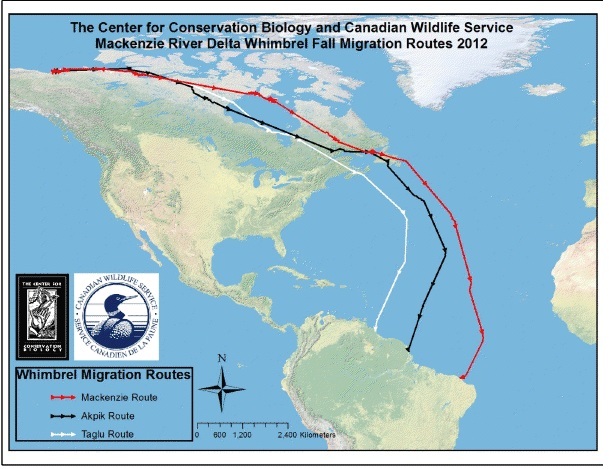 They’ve recently gone public with some amazing new information about the migration of Whimbrels from the northern reaches of Canada and the US to their wintering grounds in South America. The group has been tracking the birds for several years now, but this year three of them took a previously unknown route south, coming across to stage at James Bay and the Gulf of St. Lawrence in eastern Canada before flying overwater across the middle of the Atlantic Ocean and finally making landfall on the northern coast of South America between Guyana and Brazil. The ocean-spanning portion of the journey takes approximately 6 days, during which the birds average 30 miles per hour without stopping. An incredible journey, indeed. We’ve known that Whimbrels have impressive migrations for some time, but the specifics are only now becoming clear. It was only in 2007 that a Whimbrel names Winnie set the previous record for migratory achievement by a migrating Whimbrel, with a trip from the Delmarva Peninsula in the eastern US to the Mackenzie River Delta in northwestern Canada, a distance of 3,200 miles, in 146 hours. And it was only last year that we learned that Whimbrels can fly through hurricanes, when a tagged bird safely negotiated Hurricane Irene as it churned through the Caribbean. There may well come a point when we may no longer be surprised by the superhuman (er…bird) feats of these curlews, but it doesn’t appear to be coming anytime soon.